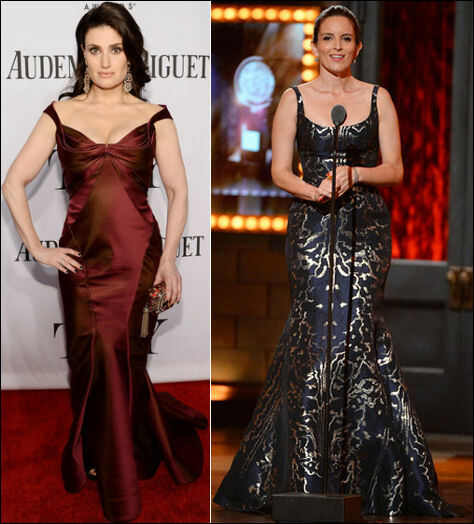 Idina Menzel wore an off-the-shoulder Zac Posen mermaid gown. Tina Fey showed off her curves in a body-hugging Oscar de la Renta Resort gown. Last night Audra McDonald made history by winning her sixth Tony Award in a strapless Escada flower print dress. Anna Gunn shined in a Jenny Packham gold floral beaded cap sleeve gown. Kelly Barrett wore a strapless floral printed organza Theia gown. Orfeh wore a cap-sleeved floor-length dress. Judith Light wore a long-sleeved Randi Rahm dress. Emmy Rossum in a slinky metallic silk lamé Ralph Lauren gown. Jennifer Hudson shimmered in a sleeveless paillette Kaufmanfranco gown. Karen Ziemba wore a side-slit shimmering gown. Fantasia Barrino sexed it up in a long-sleeved plunging gown. Vera Farmiga in a long-sleeved black Stella McCartney gown. Sarah Greene kept it simple in a cobalt halter Thakoon dress. Nominee Anika Larsen wore an anchor blue satin-faced georgette gown from Theia. Krystal Joy Brown in a white Maggie Norris Couture dress. Leighton Meester in a white short-sleeved Antonio Berardi dress.